This is the second installment in the oral history of the OklahomIraqis League, which started in Baghdad in 2006. To start from the beginning, click here. After the 2006 deployment, most of the men didn't go back to drill until April or May due to the leave they'd accrued. And, when they did, they went back to their respective armories in Lawton, Duncan, Chickasha, Anadarko, and Walters. Guys they worked with every day suddenly became guys they only saw every few months at best. So, when the 2007 football season approached, many of the men in the OIL had not visited with each other since the deployment. That's when Pyle asked OIL commissioner Cliburn if he planned on resurrecting the league. After being gone from their jobs for over 15 months, the men went back to their daily lives and tried to pretend nothing had changed. But things had changed, and everyone adjusted differently. The NFC's Rivalry Week is upon us. Here are the uniform matchups and playoff implications of each game. The "home" team is the franchise that won last season's Rivalry Week matchup. Of course, the winner of this year's Rivalry Week matchup will be the home team next season. 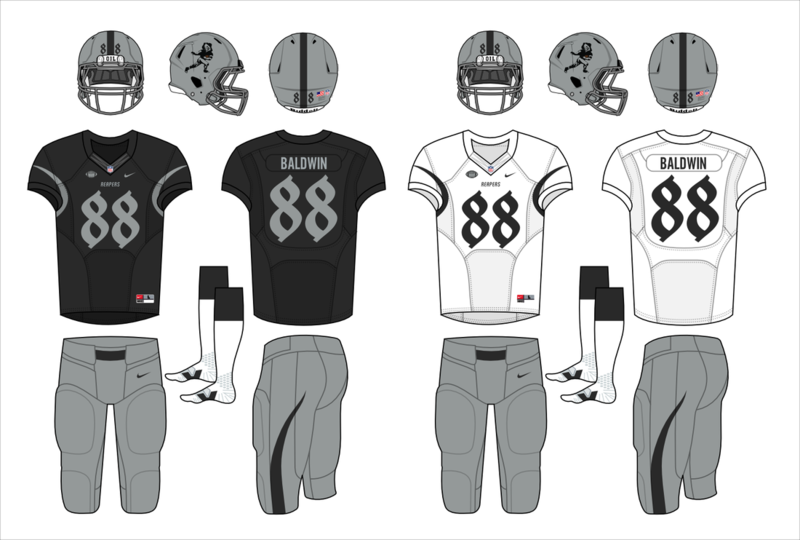 Click on the franchise's uniform to view their full uniform set. Each playoff matchup will be previewed in this way as well, with the higher-seeded team being the home team. As the home team, Duffy's Hangovers will be wearing their green jerseys. Cliburn's Arrogant Americans will wear their all-whites. Historically, the Americans have dominated this series, but the two split last year. Duffy won the Rivalry Week matchup while Cliburn got revenge in the semi-finals. Analysis: Cliburn is still in the hunt for a first-round bye. And Duffy is still fighting for a playoff spot, but he needs to win this matchup to have a chance. A loss would give the Hangovers a losing record and end their season. As the away team, Schmidt's Dead Again will be wearing their white jerseys. For Rivalry Week, Pyle's 2006 champion (and 2008 runner-up) Lucky Enuf will wear their neon green alternates for the first time this season. Although Pyle has had far more success in the OIL, Schmidt has been a constant thorn in his side, sporting an 8-5 record against Lucky Enuf. Analysis: This is Schmidt's worst season to date. And Pyle has seen better days, too. But this is the OIL's original rivalry, and these guys love to beat each other. So, while neither team will make the playoffs, it's a good matchup between two of the original OIL franchises. Baldwin's newly-rebranded Roughnecks (formerly Reapers) will wear their gold and black home uniforms against the higher-ranked (and OIL Bowl favorite) Hard Targets, owned by Finch. The Hard Targets will wear their away uniforms (with sublimated camouflage on sleeves, numbers and pants). Personally, I wish they were the home team so they could bust out their olive drab alternates, but maybe that will happen in the playoffs. This is only the fourth year of this series, as Baldwin did not join the OIL until 2011. But these two were roommates both in Iraq and back in Oklahoma, so the trash talk is always intense. Baldwin has a 2-1 series lead on Finch, but Finch has the far better team this season. Analysis: This matchup has minimal playoff implications. Finch has already clinched a playoff position and is now just hoping for a first round bye. Baldwin has won four in a row, but his seven losses will keep him out of the playoffs. This one is all about pride for the Roughnecks. Henderson's DARC NARCS will sport their 8-bit graphic-inspired home black uniforms. Trovillo's Dirty Hippies will wear their traditional away jerseys with tie-dyed accents. Perhaps we can look forward to the Hippies' tie-dyed home jersey in the playoffs. This is another relatively new rivalry, but it makes sense as undercover narcotics officers and hippies probably do hate each other. Here, the NARCS own a 3-1 series lead. Analysis: The Hippies are one of three teams fighting for a first-round bye, so they can't afford to overlook Henderson's squad. Yes, they've already clinched a playoff spot, but the first-round bye is incredibly valuable. Meanwhile, the NARCS have a chance at the playoffs with a loss, but they can clinch the playoffs outright with a win. Leal's Norman Nobodies will wear their home jerseys against former champion Morgan's Whackers in their white away jersey. These two played high school football together. They were roommates in Iraq. Morgan beat Leal in 2007 for his only OIL Bowl championship, but Leal owns a slight 6-4 series lead (including a victory last season). Analysis: After suffering his seventh loss last week, Morgan is now playing for pride. Leal has been in that boat for a while now, as the Nobodies' 3-9 record is tied for the league-worst. So, no playoff implications here, but a very good matchup of bitter rivals. 2013 champion Cobb's Dogs of War will likewise wear their home jersey (with sublimated pitbull on the shoulders) against two-time champion Bruesch's SoonerJack in their white-on-white away uniforms. This is the only rivalry where each franchise has won an OIL Bowl. SoonerJack has won two, in fact (2008; 2011). But Cobb has dominated this series featuring former Third Platoon soldiers 7-2. Analysis: This battle featuring former champions is all about pride as both teams are guaranteed to have losing seasons. Perhaps Bruesch can cut into Cobb's 7-2 series lead, which is the most lopsided of the league's rivalries. Jessen's DominationStation will take the field in their "pain train" home uniforms against Rogers's AMMODOGS in their alternate away uniforms inspired by the old Acme Packers. These two used to talk trash while serving in the same launcher. Now they do it in week 13. Jessen holds a 3-1 series edge, but the teams are pretty evenly-matched this season. Analysis: This is the perfect Rivalry Week matchup. Not only are these two bitter rivals, but each team's playoff hopes come down to this game. Win this game, and you're in the playoffs. It's that simple. Rivalry Week matchups don't get any better than that. It's coming down to the wire in the OIL1. Three teams clinched playoff spots last week, but no one was able to clinch this week. With one week left in the regular season, three spots remain open. This is Rivalry Week in the OIL1, so check out those matchups. Four OIL2 franchises clinched spots in the inaugural OIL2 playoffs this week. Two spots remain unclaimed, and six teams have a legitimate chance at clinching them. In the OIL1, three teams have clinched a spot in the 2014 playoffs: Trovillo's Dirty Hippies; Finch's Hard Targets; and Cliburn's Arrogant Americans. Six teams are competing for the other three playoff positions. Two of those teams (AMMODOGS and Hangovers) play each other this week. Two others (DominationStation and Lucky Enuf) play one of the playoff teams this week. DARC NARCS and Whackers play teams out of the playoff hunt and should move up in the rankings with victories in week 12. Duffy's Hangovers have now won four in a row to reach the fifth spot in the standings. Should they go 1-1 over the final two weeks, they should have a good chance at the playoffs. Winning their final two games all but assures a playoff spot. The same is true for other teams in the playoff hunt. This season will come down to week 13's Rivalry Week. Meanwhile in the OIL2, no one has clinched a playoff spot yet. Ten teams have a realistic shot at making the first OIL2 playoffs. And Musselman's Apes have won three in a row after losing the first eight games of Musselman's fantasy football career. He won't make the playoffs, but Musselman is playing for pride and earning respect along the way. A weird week in the OIL1. The top three teams all lost . . . with all of their matchups coming down to the second half of the MNF game. This, while the bottom three teams all won their matchups. The playoff picture after the top three teams is a mess as two 6-4 teams are followed by four 5-5 teams with higher point totals. Anything can happen these last few weeks. And do not forget that Rivalry Week is coming in week 13. Chaos reigns in the OIL2 as well. For the second consecutive week, Charlie Neely's Hooligans defeated the number one team in the league. Musselman's Apes won their second consecutive matchup to get out of the cellar. Four teams have taken advantage of good roster management and favorable schedules to rise to 7-3. The final two playoff spots are up for grabs with five teams at 5-5 or better. This is the first season of the OIL2, and it has had its growing pains. One team appears to have been abandoned from day one. Another has started players on bye as of late. But 10 teams still have a chance at the playoffs and fantasy-rookie Musselman is still giving it his all. Good luck, everyone. NOTE: This has nothing to do with fantasy football. It is merely the opinion of the author. I don't know about you, but I have mixed feelings about Veterans Day. Being thanked for my service always feels awkward . . . almost fraudulent. I am a veteran, and I did serve in a combat role. But I feel like my service was meaningless. No one at home is any safer or more free because of my actions in Iraq in 2006. And it's hard to convince me anyone in Iraq was (or is) safer because of my service. So I shudder when I'm thanked for the time I spent in uniform . . . feeling like I just received an undeserved award and don't know how to politely return it. I did serve though. And, no matter the short- or long-term effect it had on Americans and Iraqis, I risked my life every day in Iraq while wearing the U.S. Army uniform. Hence, the mixed feelings. But I know that these are all my own personal feelings, and it would be rude to unload all of them on an unsuspecting stranger just trying to do the right thing on Veterans Day. So I say thank you and move on, but the mixed feelings remain under the surface. Those that know me from the 2006 deployment also know that I came home and joined Iraq Veterans Against the War. Many in our unit were unhappy with that. They told mutual friends I'd betrayed them for giving my personal opinion on the war. That hurt, but it did not stop me from using the First Amendment freedom we all swore to uphold. If I could do anything differently, it would be to choose my language more wisely back then. I think some of our guys perceived what I said as an indictment on my unit, my fellow soldiers, the Army, and our country. But it wasn't. It was an opinion on a policy and its effects. Of course, when I gave my opinions on the policies that made up the Iraq War, I was a young 20-something fresh out of the sandbox. I hadn't taken classes in communication, public relations, law, or journalism. I didn't think about all the ways my language could be interpreted before spouting off at the mouth. I didn't even own a thesaurus. I once said that we were subjugating Iraq. That wasn't accurate, and I earned a lot of criticism for that statement. But the hyperbole made sense in my head. If I could do it over again, I wouldn't have used that word. But that's because I'm now in my 30s with more life experience and more education . . . and a thesaurus. I also wrote about the possibility of refusing to go back to Iraq. I wrote about maybe seeking a conscientious objector discharge. I considered both as my thoughts on the war weighed heavy on my conscience. The problem is that my life back then was a stream-of-consciousness journal routinely published online. So, even though I quickly dismissed the idea of refusing to deploy again, I was labeled a traitor by some. Others said I was a member of the female anatomy for seeking a conscientious objector discharge . . . even though I didn't. I researched it and ultimately decided I wasn't a conscientious objector. I was just a young, angry, confused, bitter soldier who should have been discussing his issues with a trained professional rather than posting them all online for the world to read and interpret on their own terms. So that experience speaking against the war fuels the mixed emotions I have on Veterans Day. Personally, I still think the war was a disaster and my service helped no one. But I'm proud of my (our) service. I woke up each morning knowing it could be my last and still rode off the base standing out of the top of a humvee. I followed orders. I got shot at. I experienced IED blasts; Hell, we all did. I did my job the best I could. I protected my friends and comrades while treating everyone with the most humanity I could in the situation. And that's what brings me to my message for all my fellow veterans of that 2006 mission. You did, too. Just know that I know that. And I won't forget it. No matter my opinion, your opinion, or anyone else's opinion of that war, we all did our jobs. We risked our lives every day because our country asked us to. Some of us did it because we thought it kept the country free. Others because of the adventure. Still others to provide a better future for their families. But, no matter the reason, you risked your life doing something that the vast majority of our citizens never will. Thank you. I am proud of my service. I am proud of your service, and I respect all of you more than you'll ever know. If I didn't, I wouldn't devote so much time to this website. To our oral history. To keeping in touch. To remembering our fallen friends. However you feel about Veterans Day, I hope today is the best Veterans Day it can be for you . . . wherever you are now.